I have been younger in October / than in all the months of spring. 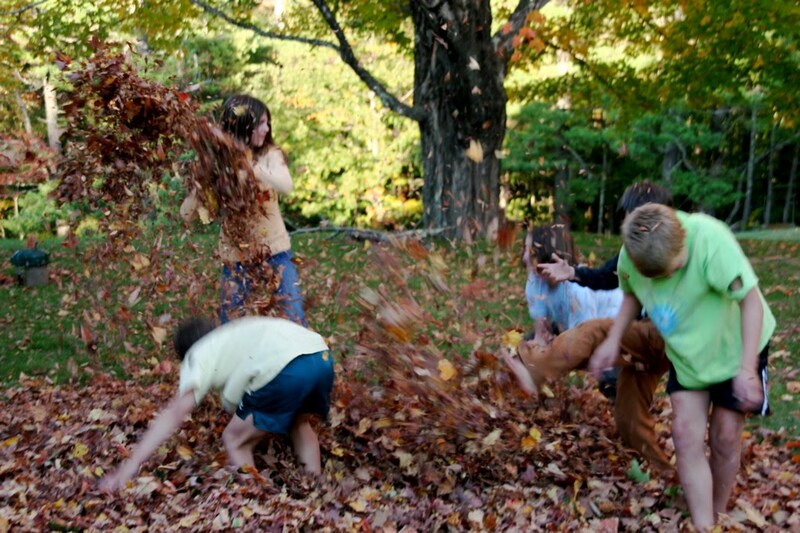 Those lines come from a poem by current U.S. poet laureate W. S. Merwin, who must have spent some time playing in autumn leaf piles, as we did last weekend. Friends invited us to spend the day with them while they closed up a summer place. Our two children mixed in with six others, ranging in age from a toddler to a high schooler. It didn’t take long for the eight children to focus on the leaves that had fallen around two grand sugar maples in the front yard. At first the adults chatted near the porch, parents keeping loose watch on the running, shouting kids. But then something changed. I heard no orders, saw no leader, but the children had moved from random play to organized play. 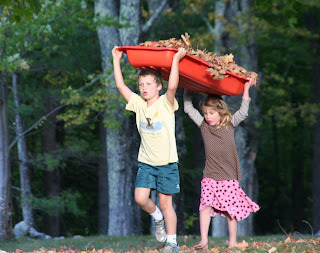 Out came rakes, followed by two bright orange sleds, repurposed as leaf carriers. 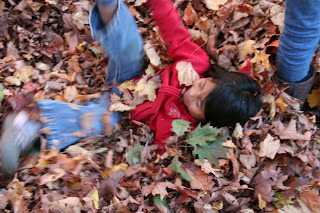 The leaf pile grew until I could barely see the top of three-year-old Ana Luisa’s head on the other side. The children scouted for leaves in an ever-wider circle, bulking out the pile. Finally, the younger ones couldn’t hold off any longer. Ana and five-year-old Caroline jumped in first. Virgil gave the Hi-ya! yell he’s learned at karate and dove in after them. 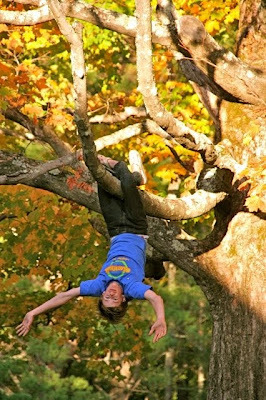 Then it was a free-for-all — a tangle of legs and arms and the occasional head popping up out of the middle amid whirling leaves and giddy laughter. When the leaves had scattered too widely to tunnel into, the children pushed them back into a pile and jumped in again. This went on for a long time. The children were intent on their tasks. 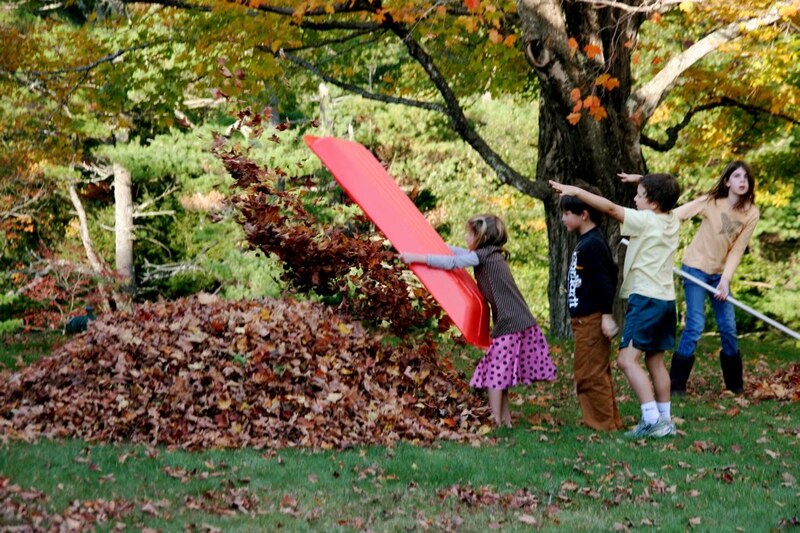 They filled the sleds, carried them, dumped them. They measured the height of the pile and coached each other in holding off from jumping in until it was time. The older ones kept the young ones safe, calling out and even pulling bodies apart if they threatened to collide with too much force. Mother of Ana and two boys, Jessie Griffiths is an educator who believes in the value of unstructured play. Watching next to me, she said, “This is what happens when we give kids time to play.” They often arrive at a common purpose, working together and learning while they play. The older kids moved on to climbing the trees. Charlie, age 15, wrapped his legs around a branch on one of the maples and hung upside down. Ursula and her friend Gray walked their bare feet up the deeply furrowed and rough bark of its neighbor and settled into high perches. Caroline and six-year-old Cole wanted to follow the older ones. 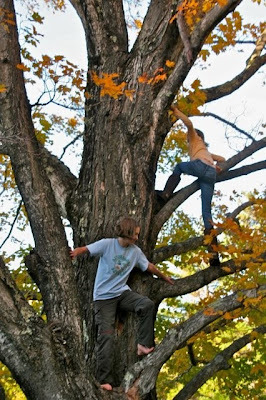 They clung to the lowest branches before dropping gratefully into parents’ arms. I’m glad we had this one.